I managed to squeeze in a little more time to work on Jen's Sketch For You To Try this week. I love the versatility of this sketch and I can see myself pulling this one out again. 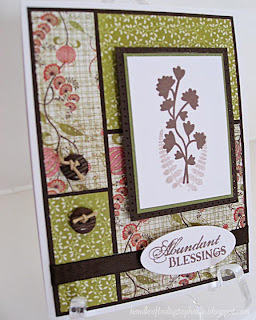 For my card, I chose one of my favorite Verve sets, Abundant Blessings. I just love the images in this set and I haven't even inked them all up yet! My card is pretty self-explanatory. I let the patterned paper (Basic Grey and Making Memories (green floral)) be the main focus again and stamped simple silhouettes for the main image. WOW!! This is stunning! Thx for playing!